All registrants get a technical t-shirt and finisher medal. Accurate and timely results are provided by chip timing. Post-race festivities include healthy food, free massages, awards, preliminary race results, and lots of local comaraderie. Packet pick-up will be available the Saturday before the race as well as on race day. Bike mechanic available on race day. Limited race day registration will be available. Sign up early & guarantee your slot today! 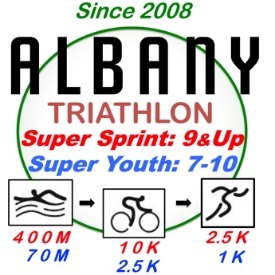 See AlbanyTri.com for more information, racing tips, and special announcements. 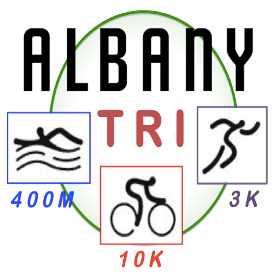 The Albany community triathlon (AlbanyTri.com) is a fundraiser for the Albany Athletics Boosters — a 501(c)3 non-profit organization raising funds for both high school & middle school athletic programs. Starting in 2008 on the centennial of the City of Albany, CA, the AlbanyTri has been held annually except for 2010 & 2011 when the pool underwent a major renovation. The triathlon aims to promote fitness in the community and showcase just how fun a multisport event can be! The main AlbanyTri super sprint course is open to everyone ages 9 and up, especially those who’ve never done a triathlon before but would like to give it a go on an easy, local course without a huge financial (or training) commitment. A mini version of the course is available for the "Super Youths" ages 7-10. The event is part of Albany Local Week, celebrating the city of Albany, CA offerings.